No objections here as the Ace Attorney Trilogy HD remake hits iOS. 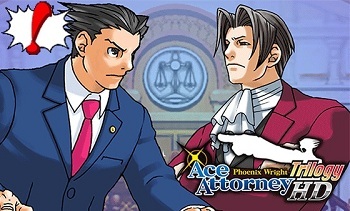 Last August, Capcom excitedly announced that its popular legal adventure series Phoenix Wright: Ace Attorney was getting an HD re-release on the iPad. The fall release date came and went, and the sobs of fans carried throughout the cold winter. Now that the snows have thawed, Capcom has returned, bearing the promise of Phoenix Wright HD, for real this time. No really, they have a release date and everything now! Phoenix Wright: Ace Attorney Trilogy HD will finally hit iOS devices May 30th. Your first experience with Phoenix Wright was likely on a Nintendo DS. However that version was actually a port from the original 2001 Gameboy Advanced release. That's right, the first Phoenix Wright is more than a decade old. While the DS release was upgraded with touchscreen controls and an additional episode, the GBA-era graphics remained. Now, that ancient artwork has been cleaned up by the finest pixel archeologists and prepared for the iPad's high-res Retina screen. Here's a sampling of just how much Capcom has cleaned up it up. Along with prettier pictures, it also includes the new "Everybody Object" mode, which lets you send the famous Phoenix Wright interjection to friends and families. Phoenix Wright Trilogy HD will include Ace Attorney, Justice For All, and Trials and Tribulations. Just like a pusher on the street, your first two episodes are free. $5.99 will get you the rest of the first game, while the other two are $6.99 a piece. Alternatively, you can just get the entire package for $16.99 and save a few bucks.